Tuxedo jacket in black and white luxury brocade fabric. Shawl contrast lapel in black, 2 angled flap pockets with black ... 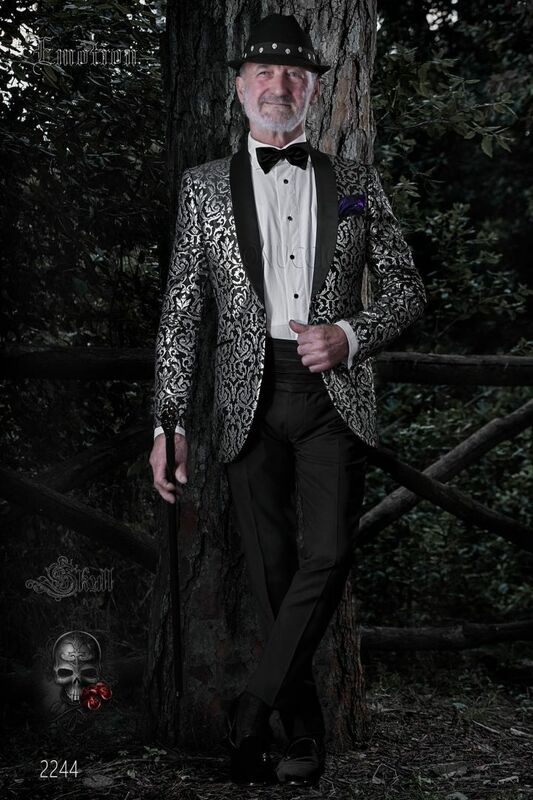 Tuxedo jacket in black and white luxury brocade fabric. Shawl contrast lapel in black, 2 angled flap pockets with black piping in black satin, 2 vents at back to make the look more casual, 1 covered button with angled buttonhole and one little covered button for each sleeve. Rounded finish to stylize the figure and tail of jacket suitable for any height. Shirt made from white cotton with classic collar and piqué bib. Exposed placket with patterned black buttons. Straight c... Shirt made from white cotton with classic collar and piqué bib. Exposed placket with patterned black buttons. Straight cuffs with black cufflinks. Handkerchief made from purple lurex. Fedora hat made from wool felt with grey skull appliqués on the band.